This is just a quick update to explain the price movements of the past couple days. 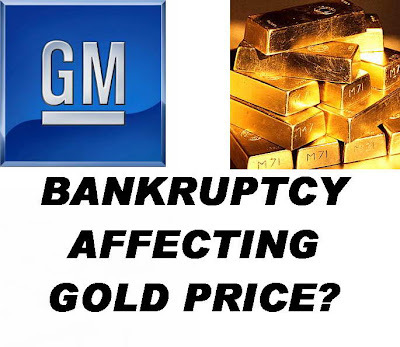 Before reading this you might like to read the full-length article "GM Bankruptcy, Gold $1000?" where I predict the future gold prices, silver prices, and also the rhodium prices, palladium prices, and platinum prices. The meat of the discussion about the gold market and price movements. Some quick info about the General Motors bankruptcy is there. Now is any of this significant? In my opinion, no. The recent bullish gold, though, having jumped nearly $50 in a few weeks, is, I think, quite significant though. Silver has jumped nearly 20% in the past month or so. Now I really do think that's something to take notice of! Keep your eyes on platinum too. It's inching up slowly. 1. Selling gold and buying silver - If you do this now, personally, I think you'll break even. Gold's high was around $1000, and at that time, silver was $22 max. However, remember how when gold was $1000 in 1988 that silver was $50 per ounce. So, what would you rather hold now, gold or silver? Yeah, I think silver. However, I'm not selling any gold to buy silver. Should I? Maybe. But I'm not. 2. Selling gold or silver and buying palladium, buying platinum, buying rhodium - If you look at charts from last year and compare them to today, you'll see that silver and gold are near their 2008 highs, yet platinum and palladium are around half of what they were in 2008. Rhodium is at 12% of it's 2008 high. Should you sell gold and silver to buy platinum, buy rhodium, or buy palladium? Maybe. It would not be guaranteed to pay off soon, but I certainly don't think gold and silver will move up any further without at least platinum moving upwards. 3. Selling palladium, selling rhodium, selling platinum to buy gold or buy silver - I would think this would be the worst gold investing strategy. However, who knows. I'd be pretty shocked if gold hit $1200 and silver $22 and platinum and palladium didn't move at similar percentages. Of the above, I would say #2 is by far your best choice if you're trading metal for metal. But why not just do this: take spare cash, buy rhodium, palladium, or platinum, and hold it, without touching your gold? That's what I would do. I've most recently bought palladium and silver and don't have much cash to invest now, but when I do, if prices remain how they are, I'll buy into the industrial metals Pd, Pt, and Rh. Spot Price Update (June 4, 12 pm) - Platinum reached $1300! Palladium $257. Gold $280. Silver under $16.